First off, I love hosting photoshoot giveaways. Not just because I tend to boost my following but also because I get to meet really great people who I might not have met otherwise! When I first relaunched my business I held a giveaway for Southern Ontario. My existing followers did a great job of spreading the word and trying to get my name out there! It’s so hard to start over in a new city and so this photoshoot giveaway was the perfect opportunity to spread the word that I’m back and I’m here in the KW area! After my giveaway closed I entered everyone’s names into a random generator and I got the cutest little family! Alex and Evan are engaged (and hadn’t done engagement photos yet) and they have the cutest little baby girl Del, who just melted my heart. I’m such a sucker for chunky cheeks! Plus they also brought their fur baby along and we got to capture the whole family as well as sneak in some engagement photos! I love how these turned out, they were so much fun to work with! We went to Victoria Park which is a really popular location for pictures because there is so much variety and beautiful landscape, but since I’m new to this area, I haven’t done any shoots there yet! I loved it! I love all the bridges and the willow tress and the klittle creek. I’m definitely excited to shoot there again! Usually there are a few jitters at the beginning of the shoot when we’re first meeting and start taking some pictures, but not this time. Alex was a pro and you could tell that Del was comfortable in front of a camera! Evan was great and they all took direction so well and were just such a joy to photograph. I love seeing the relationships and personalities in front of the camera. Seeing the love that Alex and Evan had for each other and for Del was so cute and I had so much fun that we definitely spent more than an hour taking pictures! It’s so hard for me to stop when I’m having so much fun! Okay, how is it that I am pretty good at keeping up with my personal blog but when it comes to my professional blog and drag my feet? Anyway, that’s just been on my mind lately! Back in September I booked my first wedding since rebranding and relaunching my photography business here in Waterloo! I was super excited to meet Erin and Dan, they were so easy going and relaxed, it was definitely a good start to working in this area! It’s always hard to start building this kind of business again and again and so I’m super excited that we are in the Kitchener Waterloo area to stay and I can develop lasting relationships in the wedding industry here and meet new, amazing clients! So after booking, the fun begins! 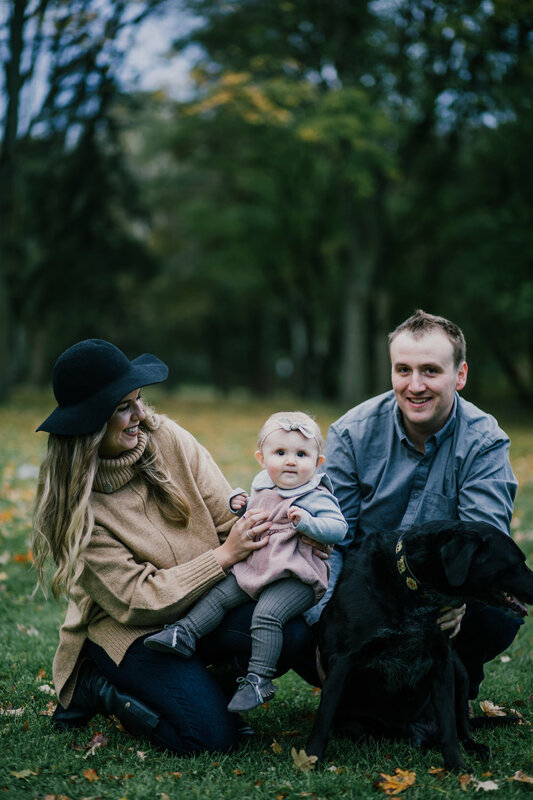 Erin and Dan are having a Niagara wedding next year and although they are excited, Erin had originally dreamed of getting married under a big tree before they fell in love with the Niagara vineyards (which are super timeless and a very good choice for weddings!). So her only request as far as locations went for their engagement shoot was a big tree. She still wanted to have those pictures so I kept that in mind as I looked for places. While I was looking, I had volunteered to photograph a small race in Cambridge at Riverbluffs Park. When I pulled into the parking lot I saw these beautiful willow trees and I immediately thought of Erin! Plus the Slit Barn is really close to Riverbluffs Park and that is also an excellent spot for pictures (and weddings!). We met up there and although it was a little bit chilly, they powered through and we had a fun time and they got to watch me climb and jump and hide in bushes! 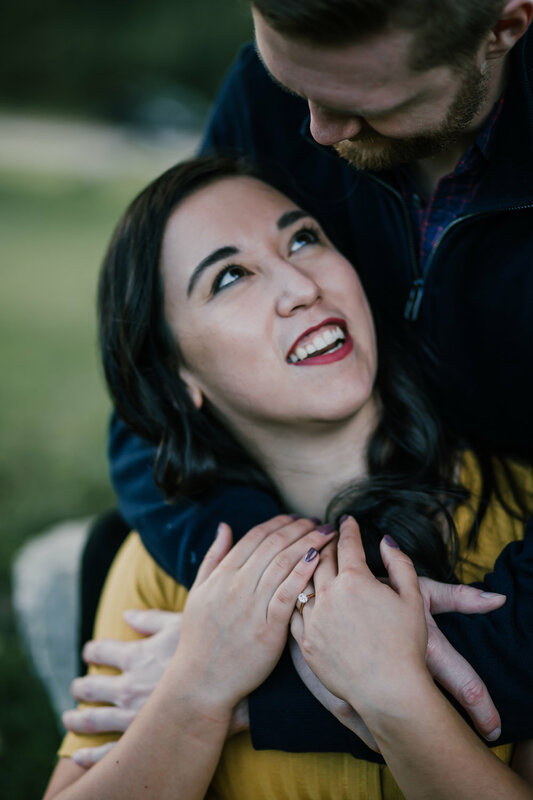 This is why I love engagement sessions and despite the advice to take the out of my wedding packages, I leave them in because I love this opportunity I get to work with a new couple. It helps me get to know how they photograph and how they work in front of the camera. It helps them warm up to me and get to know my style of shooting and be more comfortable in front of the camera on wedding day. So my advice as a wedding photographer is to do an engagement shoot with your photographer!!! I promise it’s worth it and you’ll get some really fun pictures. Some of my favourite pictures are still my engagement photos, even though that was 9 years ago and we rocked the white shirts and jeans! 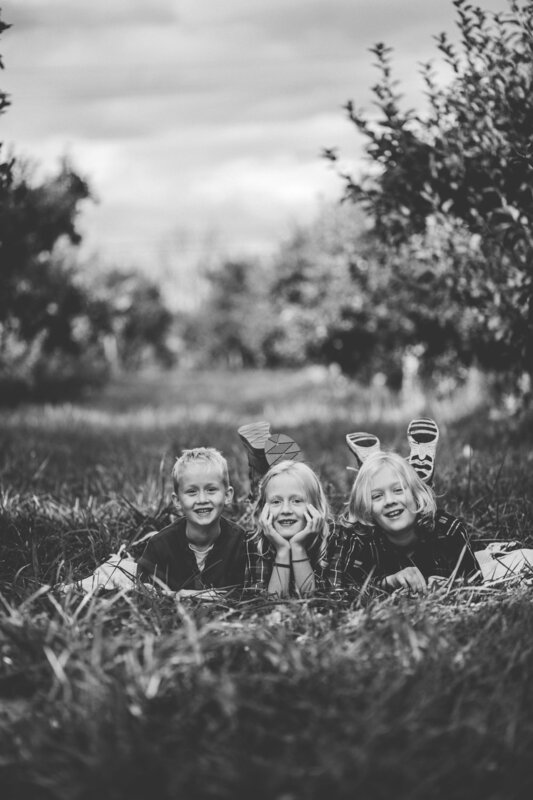 I love fall mini sessions. If Christmas was in the fall it would be my favourite season ever but because Christmas is in the winter, I’m torn. 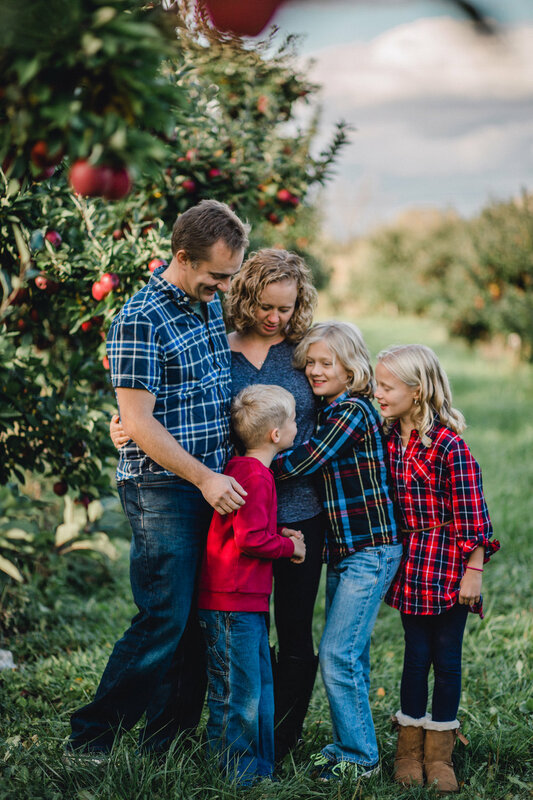 Anyway, I love hosting fall mini sessions especially because here in Ontario we have (in my totally unbiased opinions) THE best orchards ever. If you don’t believe me just take a look below! 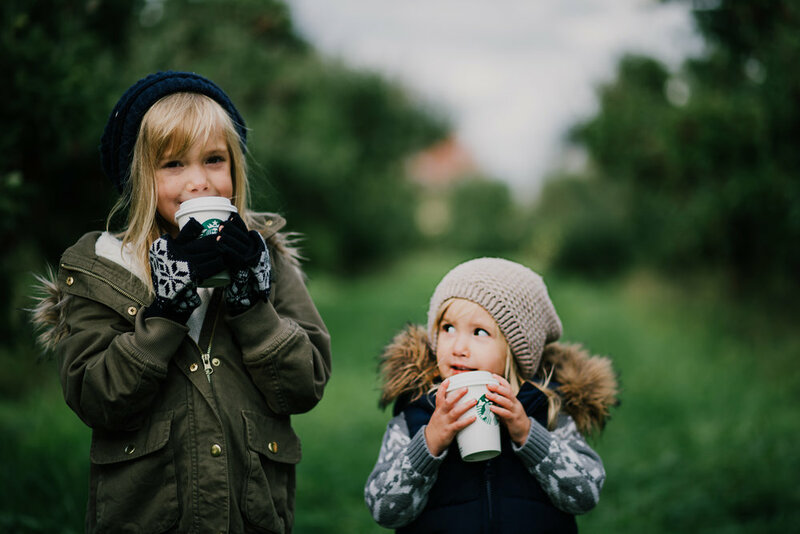 I am new to the area of Kitchener-Waterloo so it made sense to host some mini session for my first fall as a photographer here! I had so much fun with these families, my face hurt from laughing and smiling so much! I can’t wait to do them again next year! 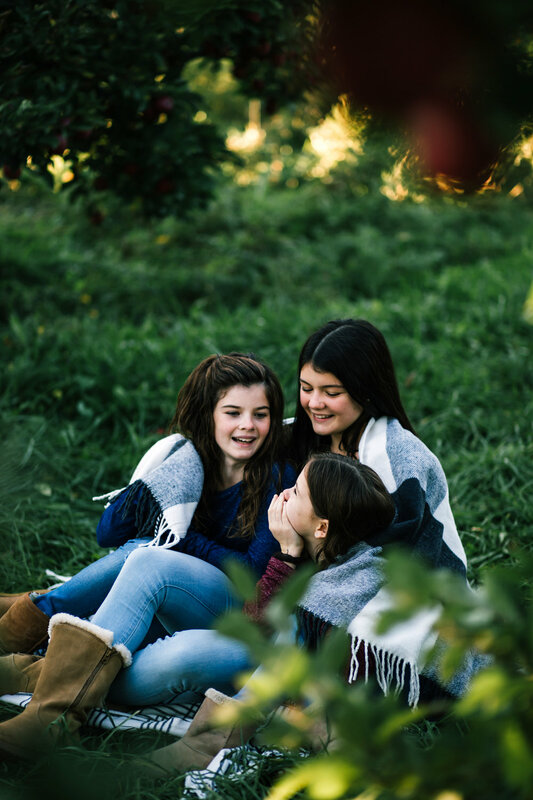 I was able to shoot at Martin’s Family Farm and it was the perfect locations for fall pictures. 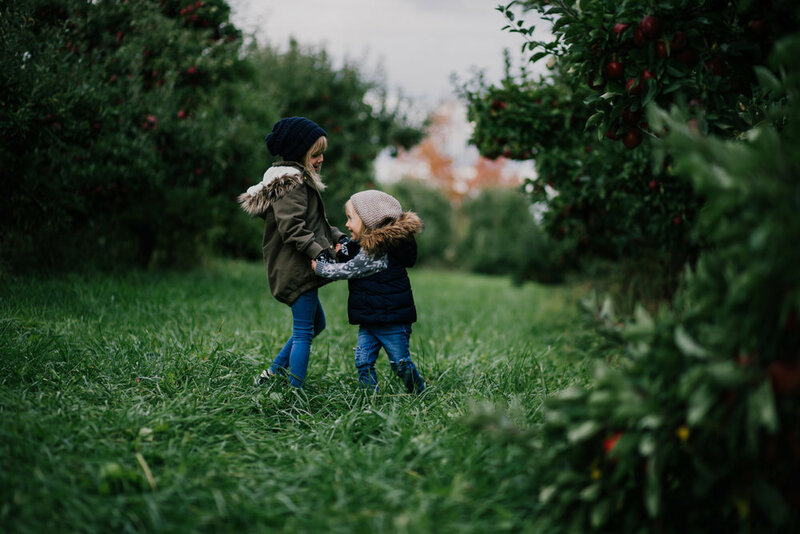 As much as I love the changing leaves, nothing screams fall to me like an apple orchard. How awesome are those red apples on these trees? It was absolutely perfect. It was a chilly day sometimes sunny, sometimes cloudy but it all worked out so well. After such a successful season and a lot of happy families, I can’t wait to have these mini sessions again next year! I had an awesome time second shooting for Ben Kane Photography! It was such a beautiful wedding and one of the most relaxed couples! They were calm and very breezy the whole day. They went with the flow of things and just made it so easy to capture their love. Their venue was absolutely gorgeous! Any brides planning a Toronto wedding really should look into the Miller Lash House. The grounds are beautiful and so many photo locations. The old house is stunning and the ivy wall behind the steps to the ceremony creates a stunning backdrop! For an Ontario summer wedding it was perfect. A little sunny during the reception but then it started cooling off and cocktail hour had the most beautiful lighting! I was in photographer’s heaven. Working with Ben was such a great experience, he really encouraged me to be an active participant! I really enjoyed working with him! The day went by without a hitch and the dinner was awesome. I would classify it as “upscale food truck” They had four stations around the room, each with different kinds of food that came in it’s own serving dish. It was a great idea and the food was delicious! The people at Miller Lash House worked seamlessly throughout the evening and I cannot recommend them enough! I really hope I get to work as a wedding photographer there so any Toronto brides, keep that in mind! I hope you enjoy the pictures as much as I loved taking them! You know what I love to see? Young love. I have a special spot in my heart for young couples because I was married young! My brother-in-law and his girlfriend have been together for just over a year and they are so perfect for each other, I love seeing them both so happy and working well together! When I was up in Whitby visiting family we decided to do a little impromptu photoshoot in the backyard! Jonathan wants to get better in front of the camera so I promised we would do a little shoot with them! It was so much fun! I love watching watching people warm up in front of the camera. As we were taking pictures they both became more comfortable and started working really well with me and with each other! It’s a hard thing to do, being vulnerable in front of the camera and just trying to be yourself, as a photographer I try to make my people feel like they can be themselves and that that is what makes a great photo! So cheers to young love and impromptu photoshoots! specializing in lifestyle photography to capture you at your best.